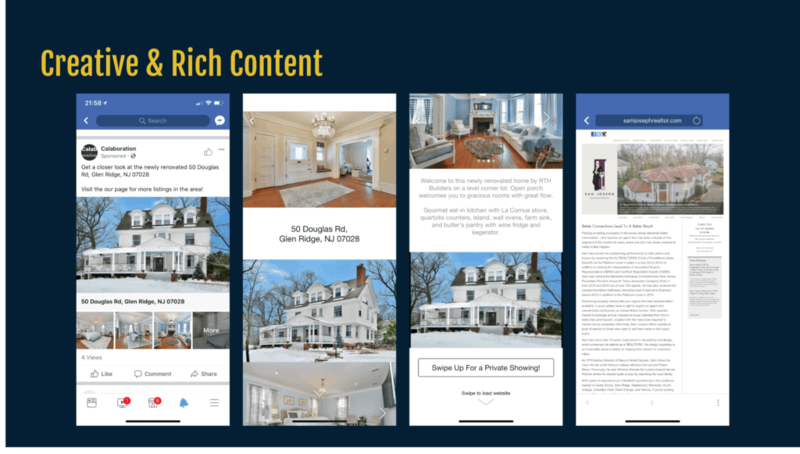 During our most recent Real Estate Marketing Cocktail Party, we discussed how real estate agents can generate more homebuyer leads using Facebook advertising. The strategy consists of a combination of Mayor Marketing and a structured & coherent marketing campaign to ultimately position yourself as the authority in your area so you can naturally generate leads without spending a dime. If you’d like, you can follow along with the presentation and slides from the event. The Q & A toward the end is not to be missed! You may be very familiar with the classic advertising funnel. And you spend more money on advertising to try it again — hey, it’s a numbers game, isn’t it? As you may have gathered, we’re being a little hard on the conventional funnel you hear time and time again. The leads aren’t vetted, they’re not prequalified, and they’re ultimately part of the quantity portion of your marketing strategy when you should be focusing on the quality portion. No one would disagree that you’d rather have 100 leads that are willing to get to the table with you than 1,000 leads that only one deal may come out of. It works — don’t get me wrong — it has worked for years and will continue to work. But that doesn’t mean it works well. The fact is, homebuyer leads—and especially seller leads—are quite valuable and difficult to acquire. No one should be so entitled to believe that a marketing funnel as basic as 1-2-3 has any right to drive such valuable traffic and yield such quality results. 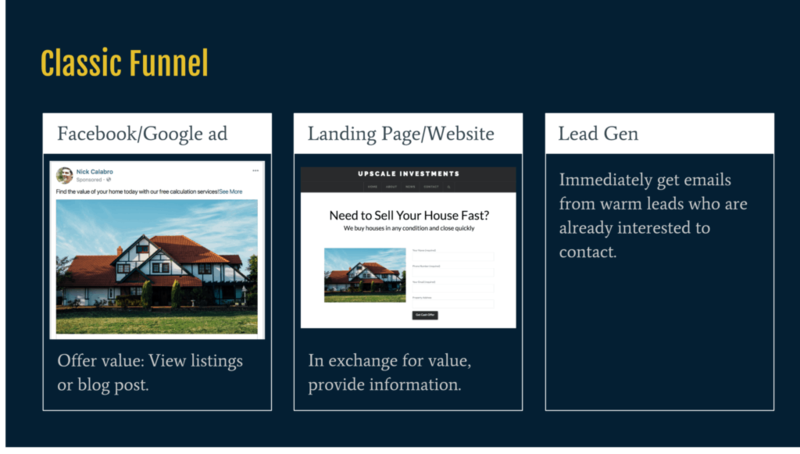 Welcome to the Real Estate Marketing Cocktail Party!Today we're talking about generating Homebuyer leads using Facebook Ads. With marketing, we always have to work backwards. If a deal or listing will make you, say, $5,000, you should be prepared to market yourself and your company so much that you might even spend $1,000 or even $2,000 on that deal. This means that if you’re getting $5 per impression, $10 per click, $50 per lead, and listing one out of ten of those leads, you’re in business. A marketing funnel & campaign strategy that is that effective can be easily duplicatable and scaled out for more volume. At that rate, you’ll be hiring sales associates and interns to assist in your business because you’re making $5,000 for every $500 you spend. These are arbitrary numbers for demonstration purposes — bear with me. The truth that many people fail to realize is that to achieve these numbers, you can’t be posting a single mediocre ad for $5/day. The classic 1-2-3 funnel isn’t terrible; like we keep saying, it’ll work—but others will work better. Let’s consider who’s actually seeing this ad, shall we? Newlyweds: This one is fine—you can target to those who got married in the last few months or a year. Hit all of them and determine for how long a couple is married (or even engaged) until they’re most likely to reach out to a realtor to buy a home. Ages 30-45: This one is also okay. It’s an easy-enough demographic to quickly niche down your audience. Just make sure the smaller age gap you’re targeting, you also widen your geographical range so you’re not only serving ads to a few people. Those within your zip code: This is necessary, a Central NJ realtor would probably not appreciate someone reaching out to them trying to buy a home in Minnesota—that is unless you’ve grown so much with your digital marketing that you have multiple offices, of course. Interested in Real Estate: This one kills us. So many agents are using this interest-based demographic in their marketing campaigns without any idea of what it actually entails. Here’s the fact—when someone is included in the interested in real estate demographic, that doesn’t mean that they’re in the market for a home, but that they’re fans of the shows that follow around high-ticket agents and home improvement. They’re interested in the idea and industry of real estate—they’re not interested in working with you. Net worth & Income: This one is, unfortunately, unreliable nowadays. Facebook used to allow you to target based on household income but those days have passed us. Now, there are options that allow you to target based on zip codes and the average income in certain areas, but that is less specific and more difficult to manage. The information seems to be sourced from public IRS data, though, so it’s unlikely they’ll be changing that up again any time soon. It’s no secret that we should always jump on Facebook’s newest features if we want to succeed on the platform. But that’s just one step. Firstly, take a look at the slide above from this meetup’s SlideShare. As you can see, this ad is utilizing many of the recently released features Facebook announced including the Canvas Ad. Facebook loves when its users (especially advertisers) are taking advantage of their newest features because it helps them push out the innovative technology they’re working on. If you come across new buttons and interesting gizmos while crafting your ads or posts, try to see if you can incorporate it—they’ll shoot you up to the top of the news feed and you’ll get better results while spending less money. Now that we can see how to craft a better creative ad, who is seeing that one? This one remains OK—again, don’t forget to play with the duration of how long people have been married, if they have children, if they’re engaged, etc. This is where so much of the magic Facebook provides comes into play. As stated above, the lookalike audience feature on Facebook is nearly magic. You’ll find so many ways to work it and tweak it to cultivate enormously profitable ads once you test enough to see what is working best. Instead of building your own following and using the low amount of visitors to your sites and pages, you can merely hijack others who have done the work for you. This means that you could tell Facebook, “show this ad to everyone who enjoys this page and is part of this person’s audience”. You’re not quite hijacking because you’re not stealing anything, you’re merely using the features the platform is built to provide for you. Do the main cities you’re trying to dominate have municipality pages? They likely do and they probably have a lot of the citizens actively engaging on those posts. That’s a perfect way to establish yourself as someone who is active in the community and an authority in the market you’re going to dominate. Similar to a city’s page, there must be local news pages, DPW, parks and recreation department pages, and anything else that anyone who may want to buy or sell a house would be interested in. Again, you’re acting as if you’re running for office—you need to be active in these circles! Lookalike audiences do get more exciting and complicated the more you dive into them but that’ll be out of the scope of this post. Focus on defining which pages and influencers you should be leveraging to run effective campaigns and you’ll be off to a much better start than 99% of the other real estate professionals who are only running poor ads that don’t amount to anything. This is a heavy topic that has a lot of nuances, but there are plenty of easy takeaways we can gather right on the surface. Facebook doesn’t (currently) allow you to directly advertise to groups. Groups are a coveted and special place in Facebook right now because they’re so effective since they’re also so authentic. Further, if you go into any Sunshine County Moms Facebook group and announce that you’re a real estate agent looking for anyone buying or selling a home, you will probably get banned if the group is worth anything at all. The strategy to effectively leverage Facebook Groups is, like any mayoral candidate, educate, brand, and build awareness. What do we mean by this? If you’re the newest member of Sunshine County Moms, the first step may be obvious. Create a post—preferably video—introducing yourself and what your affiliation is with the town. If you could gracefully plug what it is you do and how you could be of service, give it a shot. In a group that is focused on mothers, you should talk about the schools and other issues mothers would deeply care about. Next, you’re going to want to continue this with more content. Engage with the other mothers, interact with posts, create more videos discussing the latest school budget, and anything and everything else that would be of value. You may be asking yourself why we’re doing this if we’re not allowed to pitch our services. Why would we invest all this time and energy into a group like this if we’ll get banned by posting a picture of our business card? First of all, after you’re that welcomed and loved in the group, moderators might not mind if you let people know you’re here to help them list their home if they need you. We said we couldn’t advertise to groups, but you could always see who’s viewing or interacting with your content. When you post a video on your business page and share that to a group, you have that data of who is watching it. Then, when you’re crafting an ad and perfecting the audience, you can select people who have viewed that video that you posted in the group. Now, you just leveraged all of the users in that group who are extremely warm and retargeting them without them even realizing how you found them in the first place. It’s sneaky but perfectly acceptable. As always, you’re serving the people the best way you possibly can—by being relevant and remaining in their face at all times. Ultimately, the greatest and most effective ways of generating real estate leads online—whether you’re after homebuyers, sellers, investor, or even lending deals—are simply to market yourself as if you were running for mayor. When you do this consistently and when you do this well, you’ll always have people knocking on your to work with you instead of you coldly door-knocking your way to one or two leads here and there. To learn more, read about other successes we’ve had or come to one of our meetups!